EDC’s January Economic Snapshot, released last week, showed positive growth trends for San Diego's economy. The region's unemployment rate is down 1.6 percentage points from October 2013, adding 36,600 jobs from the previous year. It’s employers like Eastridge Workforce Solutions (formerly known as The Eastridge Group) that help support this job growth locally. In the next five years, they expect to nearly double in size- an indicator that San Diego's economy, and the companies that support it, are growing. 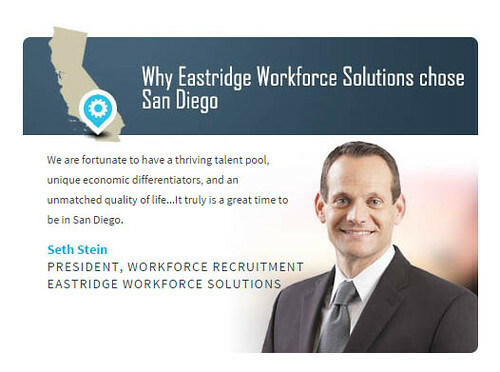 We spoke with Seth Stein, president of workforce recruitment, to learn more about Eastridge’s growth plans and how they support San Diego’s innovation ecosystem. 1) Tell us about Eastridge Workforce Solutions. As we often say, our team doesn’t have many hobbies. That’s because we spend all of our time creating and delivering uncommon workforce solutions. The competition for talent is intensifying, and the management of a cross-functional workforce is increasingly complex. By delivering leading edge, technology-enabled workforce solutions, we help our clients recruit, retain, and manage exceptional talent. We make some of the most difficult parts of workforce recruitment and management easy. For example, our Vendor Management Solution (VMS) provides real-time analytics on requisitions and staffing supplier performance, while streamlining time entry, time approval, and onboarding. We’re also fanatical with our approach to customer service. For example, we recently unified our 20 different brands into one: Eastridge Workforce Solutions. This unified brand allows our customers to easily utilize our entire portfolio of products and services, designed to optimize their workforce. 2) What are some advantages doing business in San Diego? While we serve our clients and candidates globally, San Diego is home. We are fortunate to have a thriving talent pool, unique economic differentiators, and an unmatched quality of life. Talent: San Diego has the highest percentage of bachelor’s degree holders with a STEM degree, among major regional peers, enabling companies to compete and grow. Economics: San Diego is home to industry-leading life sciences, cybersecurity, defense and aerospace companies, creating a diverse and strong economy. Quality of Life: Education, diversity, tourism, and climate truly make San Diego America’s Finest City. Dexcom, Inc., is what San Diego is all about – an innovative life sciences leader and high-tech manufacturer. Dexcom is a medical device company focused on the design, development and commercialization of continuous glucose monitoring systems for use by people with diabetes. Having received FDA approval in 2006, they provide a system to conveniently manage diabetes to the 371 million people in the world impacted by the disease. 4) What do you anticipate for your company in five years? The next five years will be the most innovative in our company’s history. In fact, we expect to more than double in size. Our real-time analytics are giving companies the data they need to win the fierce competition for talent and to manage their internal resources more effectively. By automating traditionally labor-intensive functions, we are delivering resources at an unprecedented scale. For example, last year alone, our Workforce Recruitment team helped a Fortune 50 company launch a new national team of 150 employees in 60 days. Our Workforce Technology platform helped a global alternative energy company automate timekeeping and security while decreasing costs at utility grade solar sites across North America. Our Workforce Management solutions helped one of the largest employers in San Diego increase both visibility and compliance in their workforce. 5) What do you anticipate for San Diego? In the next five years, our region’s startup and innovation culture will continue to help companies thrive. I am also confident we will continue to see an influx of young professionals moving to San Diego because it’s a great place to live, work and raise a family. It truly is a great time to be in San Diego.